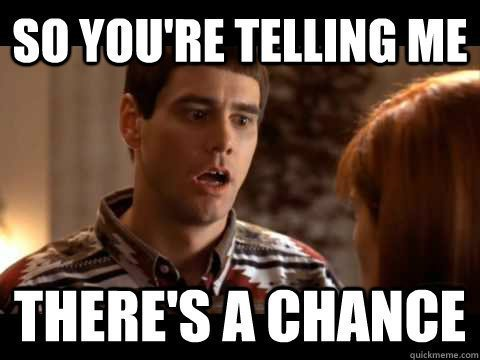 Do you remember the movie Dumb & Dumber when Lloyd asks Mary if he has a chance to be with her? 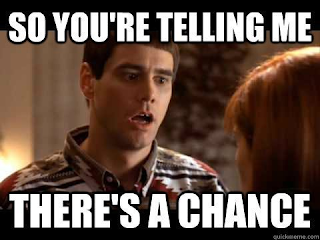 Mary says, "your chances are one in a million" and then Lloyd replies, "so you're sayin' I have a chance!" I love that line. It just confirms that you can look at anything with your glass half full even when your glass only has a drop left in it because you still have a chance. It might be a minute chance but its still a chance. You must still believe. I really do believe in second chances and I also believe in asking for the impossible because you never know what the answer could be...... until you ask. Today I found out that "The Chew" received the cutting boards I sent and they love them and will be using them. My dad suggested that I decide to be bold and ask if I could come on their show to talk about the boards and how fun they are to make and use while working in the kitchen. I think its a long shot, my glass has a drop left in it, and I'm really reaching, but you know what? That wonderful girl that works for "The Chew" said she would do what she can! She said to keep doing what I'm doing because its awesome! I am grateful for the encouragement from New York City to little Lodi, California and I look forward to following up! We are so proud of you April! You go girl! The more I read your blogs the more I realize you are a dreamer, too. I love it!